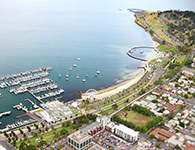 As quaint, quiet and stunning as Geelong is, it has some signature annual events up its sleeve that make this much loved city a popular destination. Of all of the events happening round the year, I ended up attending close to ten of them. However, I’m thrilled to share my experience at three of those events that I made fond memories at – The Pako Festa, Torquay Motor Show and Geelong After Dark. Pako Festa is the largest free event in Victoria that celebrate cultural diversity, and Geelong has been a proud host of this event for the past 37 years. The festival typically exhibits close to forty-five cultures, each with their own floats, parading on Pakington Street in Geelong West. It sounded like an exciting event, and my friends and I decided to be part of it. Since it was a celebration of the diverse cultures, we took a call to dress up in our traditional outfits and get involved in the festival! We flanked the sides of Pakington Street along with other spectators, witnessing the vibrant proceedings that kept us engaged for close to three hours at a stretch. Each of the cultures brought in something exquisite and gave us a taste of their signature attributes. We had various opportunities to become a part of the events. We came across a kiosk managed by a bunch of Sikhs (natives of the state of Punjab, India), where they were tying the traditional turbans on the heads of those enthused to savour some culturally significant attire! My friends seized this opportunity and I must say that they carried those turbans really well! To add to all of the festivities, the event offered local food stalls from the varied cultures that took part in the parade. We gorged on some delicious Paella and Shawarma, and ended on a rather sweet note with Baklava. Fond memories were made at the festival, and it is a highly recommended annual event that highlights the accents of each of this multicultural society. Apart from the prepossessing turquoise blue mass of the ocean that Torquay boasts of, the Torquay Motor show in my opinion, tops the list of the region’s features. With a setting so serene, the elevated showgrounds are adorned with the most gorgeous vintage cars on this occasion. They are displayed at the Elephant Walk Reserve on the Torquay Esplanade. The event has been successfully running since 2007, and was originally conceived by the Rotary Club of Torquay. Heaps of proud vintage car owners display approximately four hundred cars on the showgrounds. Prizes are given out as a token of appreciation and prestige to some of these vehicles that fulfil various judging criteria. A bunch of friends and I happened to stumble upon this event purely by accident. We set out for the beach, as it was a nice sunny day – the kind that you would want to drink in the vision of the blue waters on. And behold! There they were, a handful of cherries on the cake! The exhibition was delightful, as we got to see these beauties up close. For those who happen to be connoisseurs of old horse power, the event is not to be missed. It takes place every year, typically in the second week of February. The Geelong After Dark event was by far, one of the most enthralling experiences I’ve had in Geelong. The event description sounded quite exciting, so we layered up on a chilly evening in May and went on to experience the scattered, mobile installations around Geelong CBD. The event is primarily an artistic exploration through various media, essentially dispersed across the heart of Geelong. The featured artists explore numerous unknown and arcane territories through their installations, which may be in the form of light displays, soundscapes, cosplays and surreal costume designs. We came across the most intriguing and engaging installations and pieces of art. The silent disco was one that we enjoyed the most, and we tired ourselves as we danced away! The best memory of the night however, was unfolded by the most hilarious sequence of events. As we walked down Little Malop Street surrounded by intriguing fragments of the event, I happened to spot two men in the best Batman and Joker cosplays I had ever witnessed, sitting in a café, sipping hot chocolate. I was so taken by their costumes that I subconsciously froze and ogled them for a minute. They saw me and generously let go of their drinks, only to come out of the café and take a picture with me. My day was made! These were my top picks in terms of events that take place annually in Geelong. Some fond memories were made, and they have now become a permanent association with the city that I now call home!